Display ads or content across a multitude of areas on your site all from one simple to manage spot. Pairs perfectly with the lead generation tool, ConvertFlow, for embedding targeted, dynamic CTAs. 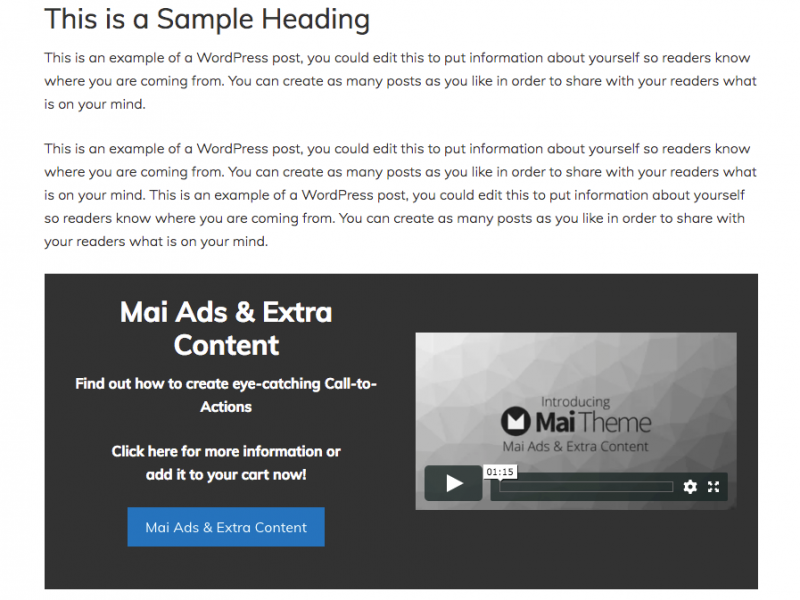 Save $50 with the Mai Theme Plugin Pack! 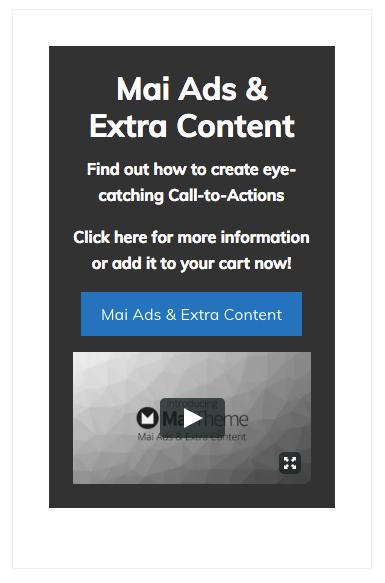 Mai Ads and Extra Content easily allows you to add your advertising code to a ton of content areas on your site. Easily display ads or content before or after your header, on the left or right of your logo, after the banner area, before or after your posts, inside your posts after any number of paragraphs, in widgets, in your footer, and practically anywhere you want. In conjunction with the lead generation tool, ConvertFlow, you can even use these areas to display targeted, embedded CTAs on key places throughout your site. Dynamically switch out your CTAs depending on your where the visitor is in your sales flow process, so they are always presented with an offer that is relevant to what they need. 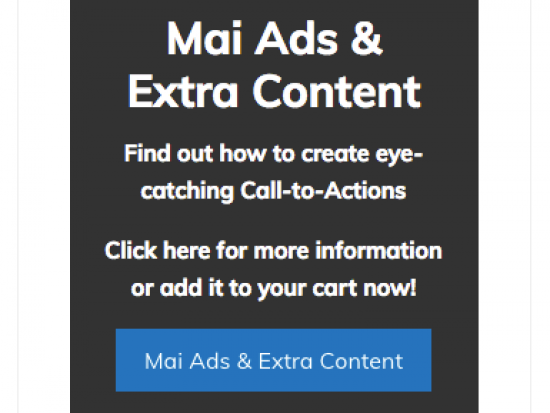 See how we use Mai Ads & Extra Content with ConvertFlow in our posts at BizBudding Inc. The header and footer code is not a display area. It’s a great place to insert your Google Tag Manager codes. These are the custom ad and content display areas displays on every page of the site. • Header Right – right of your logo area. These are the custom ad and content display areas displayed on single entries. 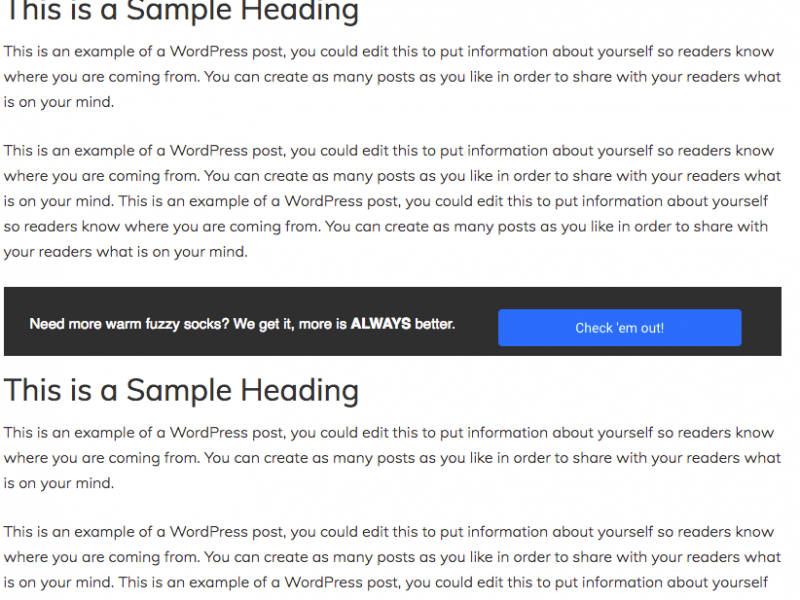 Choose the post types to display this content area on (posts, pages, downloads, etc). Widgets A, B, C can be added anywhere on the site. Drag and drop Mai Ad (A, B, C) to the specified widget. Get all plugins and save! Don’t be held back because you’re not a developer. Mai Theme already puts the power in your hands, but our plugins take it one step further! More control means faster results and a site that looks and functions just how you need it to. Save more than $50 with the Mai Theme Plugin Pack.